Your company logos and information will be posted on the official website as well as to our official guidebooks and other printing materials which are distributed to all attendees who come to the event. The logos printed on your booth and the floor map will also help extend recognition to those who you might missed the chance to meet at your booth. 15,000 leading thinkers attend ad:tech Tokyo from Japan and other countries overseas. This is an efficient place to meet and connect with a great number of people in a limited time. Also, an effective place to exchange information with other exhibitors about competitive research and current issues. ・Why Exhibit at ad:tech Tokyo? To sponsor at a global event being held at major cities around the globe, will let you appeal to the world that you are one of the innovative companies leading the industry. It will lead to increasing brand awareness of your company/service by displaying the company logo to the official website and on the signage onsite which is often exposed to the media. You can communicate directly with your future customers by handing out flyers and souvenirs, introducing your company through social media and having talk sessions at the Presentation Stage located at the exhibition hall. Coffee Break Sponsor 1,800,000 JPY Provide coffee at the conference area. BenefitsCompany logo displayed on official website/signage at the venue. Networking Party Sponsor 1,500,000 JPY Sponsor for the Networking Party held on the first night. BenefitsCompany logo displayed on official website/signage at the venue. 5 min greeting speech on stage during the party. Privilege to invite 5 people of your choice to attend the party. Networking Lunch Sponsor 2,000,000 JPY Lunch Sponsor at the conference area. WiFi Sponsor 3,000,000 JPY Provide Wifi in the conference halls. Conference Pass Lounge Sponsor 3,000,000 JPY Targeting key industry players for your company branding. BenefitsCompany logo displayed on official website/signage at the venue. Place your company brochure at lounge. Keynote Stage Sponsor 3,500,000 JPY Play a video introducing your company before and after the Keynote. Speaker Lounge Sponsor 3,000,000 JPY Displaying company logo and company brochure at the Speaker Lounge. BenefitsCompany logo displayed on official website/signage at the venue. 2 Full Conference Pass included. Lanyard Sponsor 1,500,000 JPY Company logo printed to the lanyards for the attendees. Pass Sponsor 1,000,000 JPY Company logo printed on the pass. Brochure Distribution Sponsor 800,000 JPY Distribute your company brochure at the registration desk. BenefitsCompany logo displayed on official website. Share the latest case studies with your customers/introduce your service at the Presentation Stage. Your promotion will be more effective when combined with a booth exhibition near by. *The exhibition hall is opened to all the pass holders including the visitor pass. *Slight change of approximately 10 seats may be made depending on the layout onsite. *We do not provide any lists of audiences. A quick questionnaire within your presentation time is allowed. *Stage design and time table may be changed by the organizer. 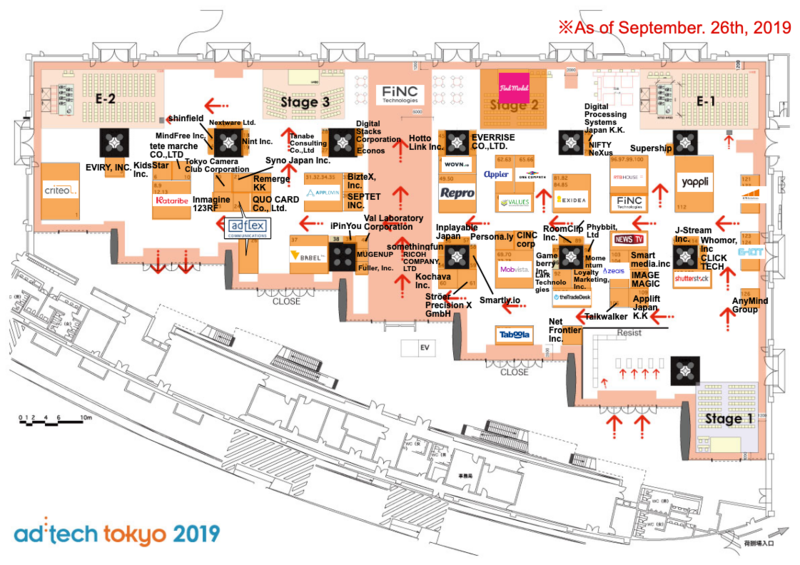 ・Why become Sponsor for ad:tech Tokyo? *The price shown below includes tax (10%). In case the tax rate does not change in Oct. 2019, we will repay the difference. How can I receive my E-TICKET ? I purchased more than 1 pass. How should I forward the pass to my colleague ? 2.click "Purchase History", than "List of Pass"
3.click the blue "+Invite to Event" button. You can send invitation emails to whomever you wish to give the pass to from this page. 4.The invited person can follow the instruction on the invitation email to register their own pass. How can I receive my pass ONSITE ? Please bring your smart phone or tablet onsite to show us the e-ticket on your bio page. Scan the e-ticket at the registration desk and your pass will be printed out and ready to go!